I was coaching a client through some issues recently that they were having at work and in doing so I used a metaphor of a burning platform to explain a way to get real and lasting behaviour change. Many managers have issues around getting their team to make the behaviour changes required for ongoing success and growth. Within this scenario there is good news and bad news. The bad news is that you cannot change someone’s behaviour. That’s right, you read that correctly. You cannot change anyone else’s behaviour. That is down to them. You can influence their behaviour by communicating why they should change. We can do this by creating a sense of urgency. Even better if you can create a sense of panic! 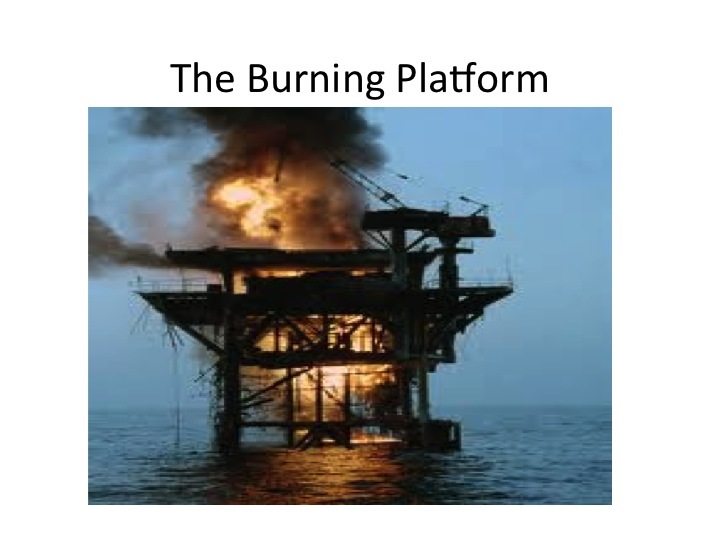 So, this is where the burning platform metaphor comes in. You can use a bridge, or even a boat. The trick here is to create a scene whereby they have no choice but to jump off the platform/boat/bridge into the water that is 150ft below and freezing cold. We change when we think that there is no other choice but to make the jump. Although many criticised this, it is a classic move to initiate real and lasting change within Nokia by creating a sense of urgency. At the very least, if you are an employee of Nokia, you now knew that change was going to happen and it was going to happen soon, so get ready to jump! International Leadership and Organisation Development Professional. Using a coaching style to support you every step of the way. Inspirational event speaker and father of 2. This entry was posted in Change Management, Leadership, Learning, Performance Management and tagged coaching, motivation, Team work. Bookmark the permalink.